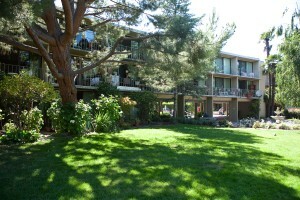 Situated on 2.9 acres, Stevenson House is home to about 167 older adults. Our residents enjoy independent living as part of a greater community of their peers, making their home in one of our three low-rise buildings in either a studio or one-bedroom apartment. All apartments have a full kitchen and bath. Outdoor areas throughout the property provide the opportunity to walk, garden, and sit at benches and tables. Mitchell Park and the Unitarian-Universalist Church are right next door. Public transportation and shopping are also within easy reach.